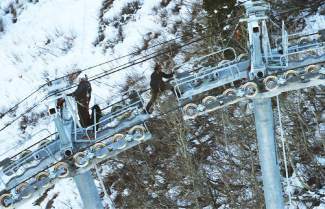 This Nov. 13, 2015 photo shows workers building a gondola that will link Park City Mountain Resort and Canyons in Park City, Utah. Park City Mountain Resort will soon be the largest in the United States with the Canyons Ski Resort merger. SALT LAKE CITY — Utah ski officials are hoping the “bigger is better” card lures more skiers and snowboarders to their mountains this season after several resorts completed multi-million dollar improvement projects — highlighted by Vail Resort’s merging of two well-known ski areas into one mega-resort. The resort will be marketed simply as “Park City,” the same name as the city where it’s located. The National Ski Areas Association doesn’t track the size of U.S. resorts by skiable acres to say for sure which is the biggest, but it says it is certainly among the largest. Vail’s expanding footprint in the Utah mountains has “elevated the game” of all other resorts that knew they couldn’t stand by idly and still compete, he said. Skier visits were down 5 percent last season, mirroring a nationwide drop. Utah officials are hoping the improvements catch people’s attention and that better snow makes for good powder after a season when the snowfall waned after a good start — likely keeping many skiers away. Even though other Utah resorts must compete with the Park City mega-resort, they think Vail’s entry into the market will pay dividends for the entire industry. Park City Mountain Resort is now one of 13 global ski areas people can go to if they buy Vail’s well-known Epic Pass, sold for $809 for adults. An Epic Local Pass that offers access to a smaller list of U.S. resorts and some restrictions is being sold for $619 for adults. “People who have never skied in Utah will come to have an experience over at Park City and then realize how close all these others ski areas are,” Dykstra said.